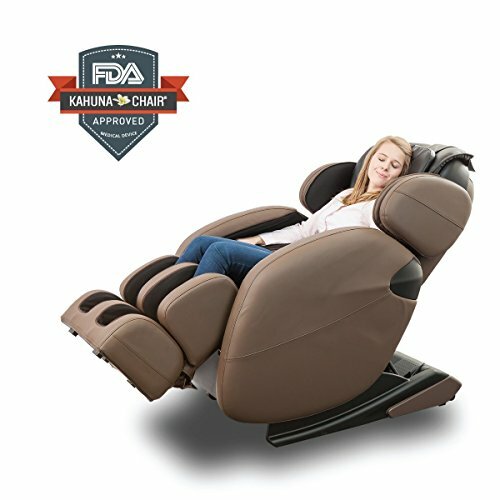 What is the benefit of full body massage and what are the best full body massagers available for use in the comfort and privacy of your home? In this article we explore the absolute quality full body massagers and learn why you deserve to invest and enjoy massage. What is the benefit of full massage? 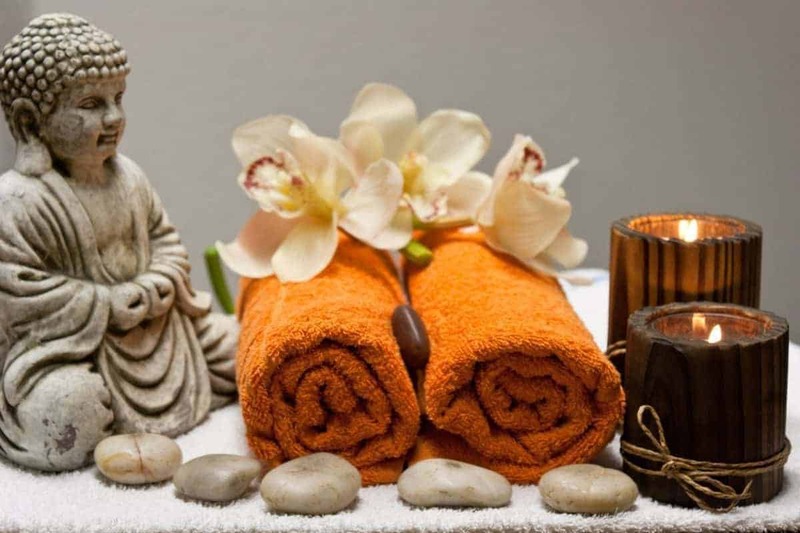 Full body massage involves the rubbing and manipulating of muscles, tendons, skin and ligaments. A full massage offers many various benefits, both physically and emotionally. Before beginning any course of massage it is always advised that you consult your physician if you have any medical conditions, such as cancer, fractures, blood clots, rheumatoid arthritis, osteoporosis or if you are pregnant. Full body massage reduces stress levels in even the most anxious of people. It is well known that massage can help manage and reduce the symptoms of anxiety and depression. Those that suffer with anxiety have stated that their symptoms decrease after massage as well as reporting that massage offers other benefits for your well-being, such as better sleep, increased energy, better concentration and less fatigue. A full body massage can relieve pain and stiffness in the body. It is said that a full body massage may assist in the release of natural endorphins, which act as a pain reliever. It is also known that massage helps relieve migraine pain. Muscles that are tired, overused or painful are softened and therefore able to relax and heal through the massage. 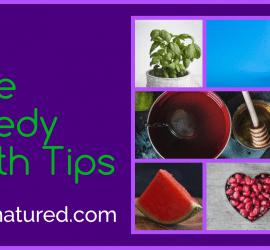 The best full body massagers detailed in this post are amazingly simple to use and incredibly effective at releasing stored tension and pain. Full body massage increases the bodys circulation and therefore assists oxygen and nutrients to reach your tissues and organs. A full body massage can also help control blood pressure. A full body massage stimulates the lymphatic system , which assists the immune system protect the body. A full body massage helps remove dead skin cells over the entire body for improved skin tone. The stimulated blood flow benefits the appearance and health of the skin. The massage can also encourage tissue regeneration, which may help reduce the appearance of scars and stretch marks. The benefits of full body massage are incredible. Listed below are several of the very best full body massagers available. If you are serious about releasing stress, improving emotional and physical health and wish to enjoy full body massage in the comfort of your own home then you will find the best (and most economical) full body massagers here! 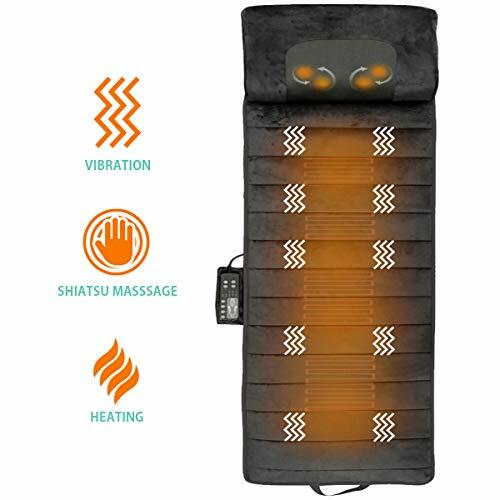 REVITALIZE YOUR DEEP TISSUE - Our vibrating massage therapy mat operates with 5 massage modes, 4 selective massage zones and 3 intensities levels that you can customize your massage experience as needed. These invigorating massage motors work in synergy on your body professionally to relax your tired muscles and refresh your tissues like that of a real masseuse. This is a vibration massager with Shiatsu neck massager only, the mat does not have Shiatsu or kneading massager with rolling balls. With 10 powerful motors, 5 massage modes, 4 selective massage zones and 3 intensities levels, the Belmint Massage Mat is the perfect way to unwind and relax your achy and tired muscles after a hard day at work. Choose the level massage that best suits your needs for muscle recovery time and increase well being. Our massage mat stimulates the accupoints in your body to melt away pain, stress, tension, knots and other discomforts. 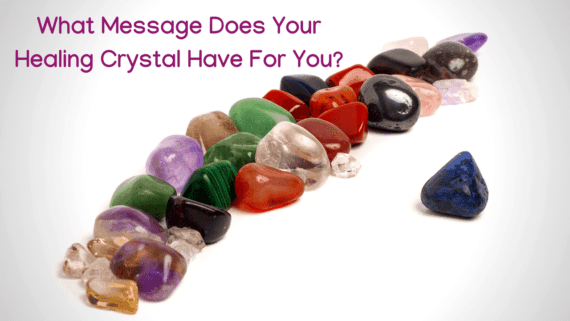 The vibration penetrates deeply in your tissues to help stimulate circulation and blood flow in your upper and lower back, legs, thighs, shoulder, hands, and feet. 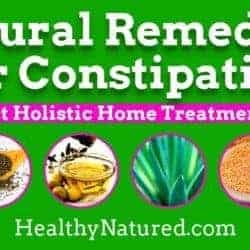 Take control of those stubborn knots, tight joints, and muscle spasms and improve much better every night. We built this massage mat with neck massager which features four deep-kneading Shiatsu massage nodes to help release stress and tension around your neck and shoulder area. No other massager provides this exceptional feature to bring your life back to normal. Backed by 12-month warranty to ensure your piece of mind. 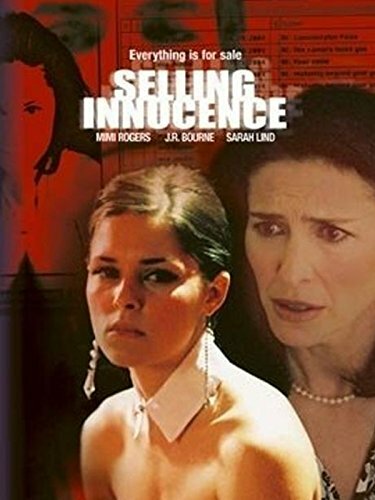 Click the add to cart button and order yours risk-free today! 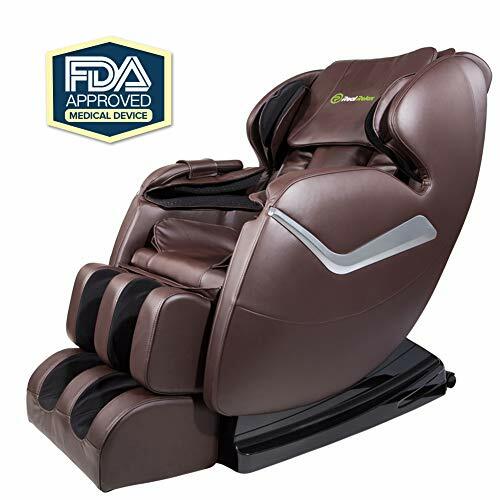 NOT JUST FOR YOUR BACK: The ZMA14 massager features an extra set of shiatsu massage nodes for the neck area with a soothing heating function that can be turned on and off separately; Also includes 3 levels of vibration massage on the seat cushion. 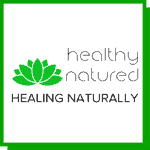 FDA listed: To deliver the safest, highest quality products to our customers, Zyllion took the extra step to become FDA registered. That means all aspects of our manufacturing and testing are accepted and backed by the FDA guidelines. Zyllion ZMA-14 SHIATSU neck and back massager cushion with heat. Deep kneading and rolling massages at the neck, upper back and lower back help relieve muscle tension and improve blood circulation and also treat upper and lower back pain. Built-in double vibrating motors at the hip relaxes the body and strengthen metabolism. The unique up-down motion of the massage nodes was designed with the concept of somatology. Multiple massage heads work together to imitate real full body kneading and rolling massage with human hands. 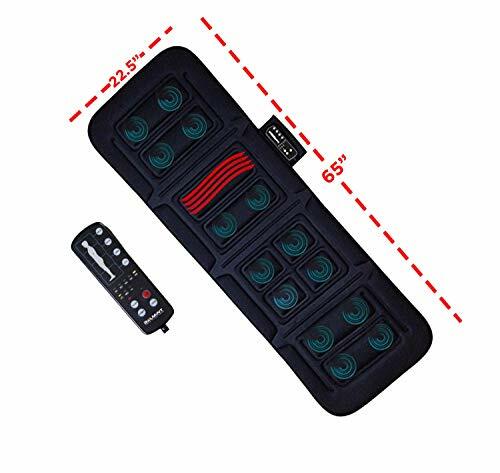 This massage cushion has three massage variations- full back, lower back and upper back massage-making it versatile and perfect to use in the office or at home. 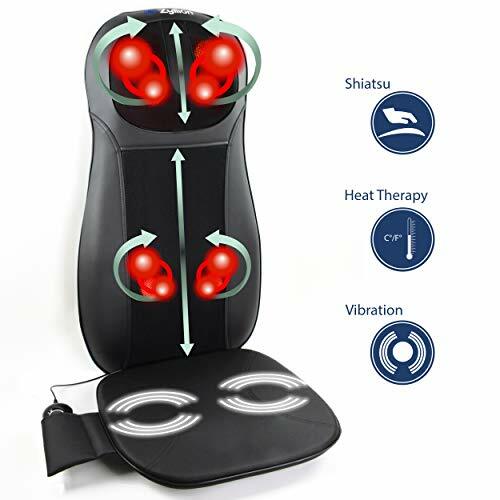 A great product if you're looking for a lower back massager with heat. To ensure complete customer satisfaction, we at Zyllion will always work hard to solve any problem you might have with any of our products. We warrant our retail products to be free from defects in materials and workmanship that result in failure during normal usage. Attach easily to any chair with its adjustable back strap. Benefits – 1. Relieve shoulder pain, blood circulation problem pain, fatigue from excessive and stress. 2. Relax tense muscle. 3. Heating function that soothes aching muscles. 4. Ergonomic design is perfect to use on lower and upper-back, neck, abdomen, calf and thigh areas. 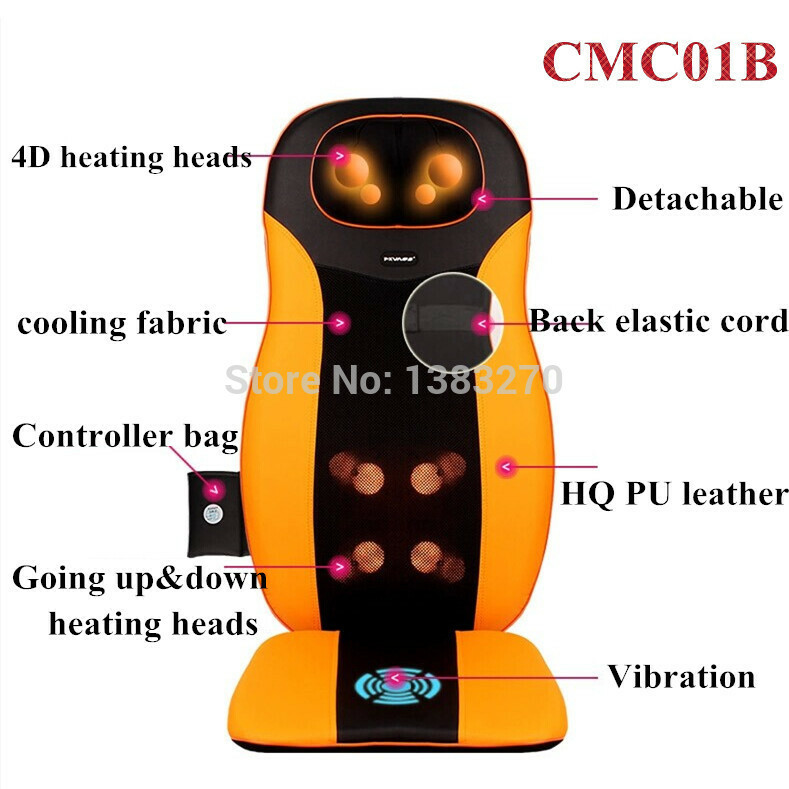 Vibration Massage-10 Massage motors provides soothing vibrating massage full body to help relief stress,aches,tension and eliminate fatigue. (The mats with 5 Massage Modes,4 selective massage zones,3 Intensities to achieve the best suited for your needs.) Note: This is a vibration massager only, not a Shiatsu kneading massager. Do not buy this product if you are looking for a Shiatsu or kneading massager with rolling balls. Soothing Heat -Four heating pads target four heating zones in the upper and lower back, thighs, and calves, to sooth and loosen tense muscles and improve blood circulation. Flexible and Foldable- the massage cushion with flexible and foldable design work fine on the bed,couch, recliner, chair and floor, and can be folded easily for transport and storage. Soft Plush Fabric- Pillow comfort and soft. The mat cover is made of 100% ultra-plush, incomparably soft polyester that is creating a comfortable , great hand feeling surface for user to lie on. 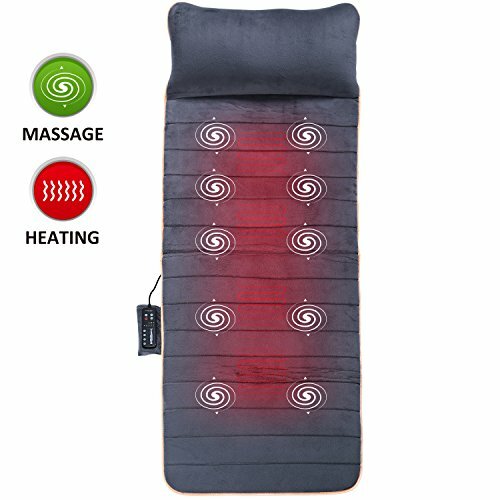 Timer: The massage mattress with heating pad with auto shut off after 30 minutes for safe use. Note:This is not a Shiatsu or kneading massager with rolling balls; this is a vibration massager only. Snailax massage mat with pillow with vibrating massage and heating pad for full body massaging. -10 powerful vibration motors for Full body massage. -5 massage Modes, 4 Independently Controllable Zones, 3 intensity Levels. - Independtently Heat function, 4 different heat zones. - 30 minutes Auto Timer for safe use. Attention: please always unplug from outlet when not in use. SOOTHING HEAT & FOLDABLE - The idea of having switchable heat function is integrated as our customers requested it. You can use both heat and massaging function to soothe your lumbar area, stimulate blood flow, and reduce anxiety and stress. This heating pad with massager is designed foldable and flexible to be able to sue it everywhere like on a chair, bed, couch, recliner, and floor, and can be folded easily for transport and storage. GUARANTEE OR YOUR MONEY BACK - if for some reason you're not happy with this Belmint vibration massage mat, we'll make it right and process a refund (or replace it if there's an issue). Trusted by thousands of customers, shop from a reputable brand with unbeatable customer service today! Press the zero-gravity button, you will feel virtually weightless,real relax physically and mentally. Other Benefits: More affordable price, built-In heaters to waist and foot, foot roller massage.